Click on this picture to see video of the rally. 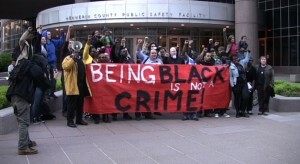 “We think we’ve arrived when our pools are no longer segregated, because we have a brother as a President, because George Zimmerman will be going to trial, let me tell you something, even though we have made much progress, this freedom cake is barely cut into” said a protestor at the rally in front of Hennepin County Jail. 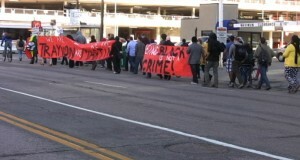 The rally marched down Hennepin from 10th St, around the City Hall and stopped at Hennepin County Public Safety Facility – the jail. The march was to express support of Travon Martin, the teen in Florida who was shot and killed by a community watch coordinator. Watch the video and hear first hand accounts of racial profiling and discrimination by the Minneapolis police and others. The marchers were urged to keep up the street actions and be present, but also to gear up for the upcoming election to elect the right people. Marcus Harcus described his treatment by Minneapolis Police and announced his candidacy for the Minnesota Legislature, House District 59A in north Minneapolis.